Governor of Imo state, Owelle Rochas Okorocha has stated that Imo people would find it difficult to vote the APC Governorship candidate in the state, Senator Hope Uzodinma. 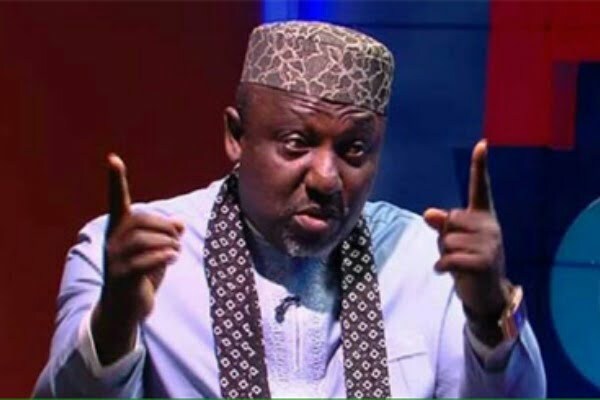 Okorocha’s claim were allegedly necessitated by a report by Uzodinma stating that Okorocha would be sanctioned for not supporting him. He (Owelle) made this known in a statement which was made available to reporters in Owerri by his Chief Press Secretary, Sam Onwuemeodo. “It would require God talking from heaven and telling Imo people, “Chief Hope Uzodinma is my beloved son in whom I am well pleased” before Imo people could consider changing their minds. If not, Imo people know those who cannot be their governor. Chief Uzodinma knows this fact and he should stop using the governor to deceive his sponsors. “Adams Oshiomhole’s preferred governorship Candidate for All Progressives Congress, APC, Imo State, Chief Hope Uzodinma, has launched repeated media campaign of calumny against Governor Rochas Okorocha and giving the impression that his problem as the gubernatorial Candidate of Imo APC is the governor. “And we wish to quickly crave the indulgence of all men and women of truth to State as follows; Governor Rochas Okorocha is not the problem of Chief Hope Uzodinma as the APC governorship candidate in the State. “Imo people knew why they settled for Sam Mbakwe in 1979. And Evan Enwerem in 1991, Achike Udenwa in 1999, Ikedi Ohakim in 2007 and Rochas Okorocha in 2011. There are certain ugly stories they do not like to hear about anybody aspiring to govern them.